The state of first base is depressing, according to Scott White, who wonders if prioritizing the historically deep position is the right approach to take. It wasn't too long ago that first base was the go-to position for sluggers. Not anymore, though. Age, a changing offensive environment and new ideas about roster construction have hit the position hard, making it at best just as deep as any other infield spot and at worst a position of desperation on Draft Day. No matter which way you look at it, it's not a position where you can expect to wait and wind up on equal footing with everyone else, as my first base tiers for 2019 show. Even those at the top don't bring the same assurances they once did. 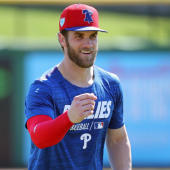 It's the same four we've been touting for years now — Paul Goldschmidt, Freddie Freeman, Anthony Rizzo and Joey Votto — and of them, the one who took the smallest step back last year, Goldschmidt, was widely presumed to be washed at the end of May, needing a scorching finish to bring his numbers back to their usual range. Of course, the only one whose 2019 prospects are genuinely worrisome is Votto, who's 35 and showed what most unbiased observers would consider obvious signs of a power decline last year. But judging by the batted-ball data, it looks like he sold out for batting average, raising his already elite line-drive rate to an absurd level, which came at the expense of fly balls. He hit the ball harder than ever, though, so it won't take much of an adjustment, particularly for a tinkerer like him, to get those ratios back in line. Beyond those elite four are a couple more familiar faces in Jose Abreu and Cody Bellinger who also took significant steps back last year. It's a similar scenario for them. Nothing in Abreu's batted ball profile suggests he won't bounce back with his usual power production, and there's no reason to believe Bellinger's power is declining at age 23. But see, normally when players have off years like that you can get them at something of a discount the next year, not having to bank on the most optimistic outlook, because others would have emerged to take some of the attention away from them. First base, though, has remained fairly stagnant. I can theorize as to why. Maybe the recent emphasis on versatility has encouraged organizations to stick with prospects at more difficult positions rather than confining them to the easiest. Maybe the way home runs have been increasing, with the lackeys closing in on the longstanding power hitters rather than everyone improving a little across the board, has indirectly hurt first base by allowing other positions to pull even with it. Or maybe first basemen age so much more gracefully than everyone else that they're holding onto their jobs longer, allowing for less turnover. Those ideas all probably have a kernel of truth to them. For the most part, though, I think it's just a blip. A lot went wrong for the reliables last year, and it just so happens there weren't many newcomers ready to step in. It's why I'm not totally losing my mind over the position on Draft Day. Generally, I can get Votto or Abreu for a pretty good value — say, Round 6 or later — and feel good about it. If Goldschmidt, Freeman or Rizzo happens to land on me in Round 2 or 3, that's fine, too. But I'm not necessarily passing up a better bat in the name of position scarcity. Jesus Aguilar and Max Muncy both make for reasonable fallback options with high-end potential. There's just the question of a second-half slide for the former and some playing-time concerns for the latter. But since all it takes is five appearances at a position to gain eligiblity in-season, you can trust another useful option will have emerged if your favorite of those two doesn't pan out. Luke Voit. The Yankees, ever flush with ambition and resources, are basically handing the job to this late-season standout, whose opposite-field power would seem to play perfectly at Yankee Stadium. Edwin Encarnacion. He's 36, has seen his strikeout rate rise and ISO fall for three consecutive seasons and is headed to a pitcher's park for the first time in his career. Joey Gallo. He's as likely as anyone to hit 50 HR, and I still think there's a .230 average in there somewhere. Luke Voit: A 28-year-old who hit more than 15 HR once in the minor leagues, it's more likely he's platooning by the All Star break than repeating his strong finish to 2018.